I’ve got a progress photo to show. 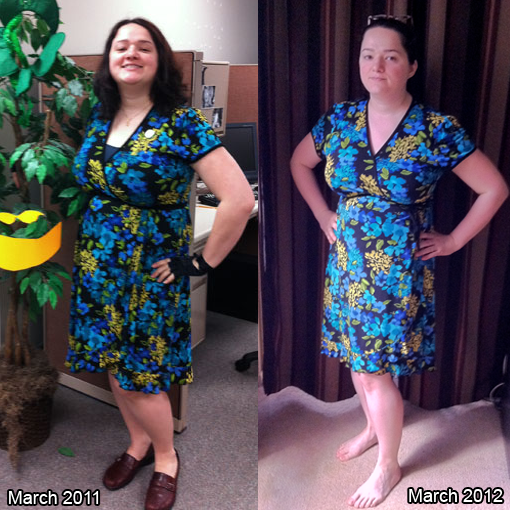 Same dress, one year and ~22 pounds apart. I started what I count as my current diet/fitness lifestyle recommitment March 2011, when I was finding it hard to fit into the largest pants I owned. I weighed around 203 pounds, which approaches my all-time highest weight. I fought my way down to about 189 as of February 2012 with the help of regular exercise and better food habits. As I said in my last post, I went to see my doctor about snoring, and he put me on a low carb diet that is very close to being paleo. Aside from minor transgressions, I have stuck to that and am down to around 180 and falling. “Minor” transgression. 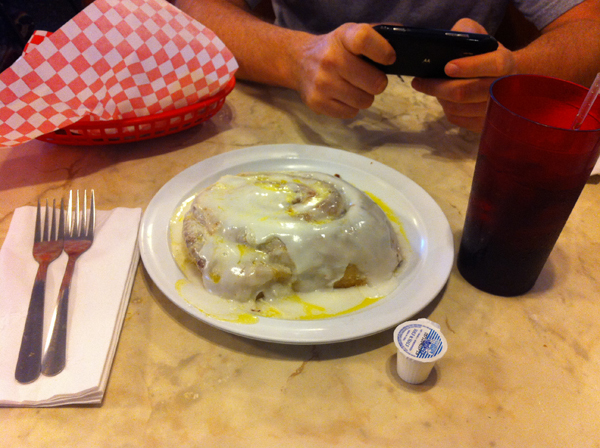 I didn’t eat it all by myself, I promise. My meals have been very low carb, for the most part. I run into the problem where I haven’t prepared lunch in time to get to work only a half-hour late, or I don’t eat breakfast. But instead of caving in to the temptation of bready fast food close to the office, I pick up hard-boiled eggs, a salad with grilled chicken, or a packaged meal (as long as it fits my low-carb rule and comes from a fairly reliable retailer so I’m not eating pig feet surprise from the super sketchy gas station a block away from the office). 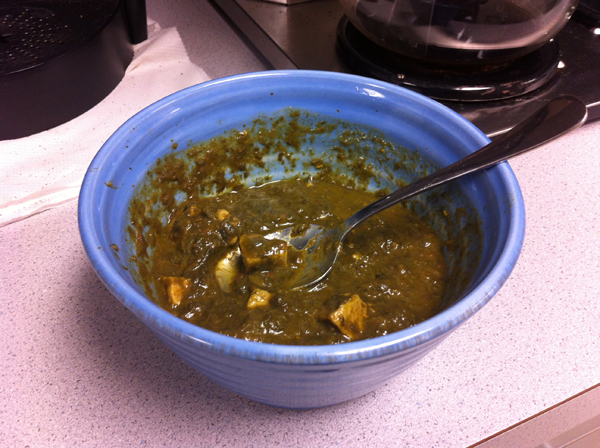 Pre-packaged curried spinach and cheese picked up at Sprouts: no rice or naan, but man, so delicious. And low carb. Preparing my food ahead of time is still the best way to get me to eat well. I spent about 20 minutes with a 3-pound container of strawberries that I picked up for a steal earlier this week. I cut up the berries and put them into plastic bags to freeze. I am still eating frozen fruit for desert almost every night, and this turned out to be cheaper than buying bags of frozen berries for $3-4 apiece. 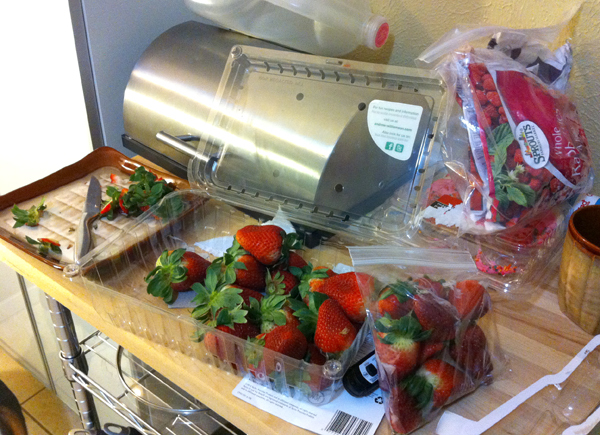 Strawberries being prepped for freezer. No way I could eat them all before they started to go bad. It is embarrassing to think about the containers of strawberries I’ve thrown away because I just didn’t get to them before they went bad, and silly that I hadn’t thought of doing this long ago. I’m sitting on that 180 threshold on my way down into the 170s, which would put me into college-era Eve weight. Like I told my boyfriend, my adorableness will become more concentrated the smaller I get. I can’t wait to post a picture of myself in this dress again in another 22 pounds. Only 17 more to go until I reach my first goal of 163. My doctor is going to be so proud of me. Yes, I’m proud of me, too, for sticking to my diet. I’m also grateful to my boyfriend, who is still supportive in every way possible, helps to keep me on course, and cooks meals that fit within my diet within reason. I still haven’t decided to start working out again, but I’m thinking it would be good for me. I changed my ergonomic setup at work, and now I’m having a bit of back pain. I’m betting doing pilates several times a week would help with that. Lifting weights may have to wait until I’m sure it’s only a muscle issue. This entry was posted in clothing, food, health, weight loss and tagged body image, food, goals, habit, health, low carb, paleo, Photos, results, weight. Bookmark the permalink.